Many think of their dog as helpful in maintaining the security of their home but what if we told you that your dog could actually make your home a target? 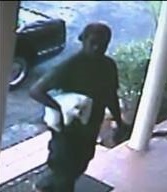 The theft of dogs from homes is increasing according to news reports. They target specific types of dogs that can be used to sell on, for breeding, for hunting or even for dog fighting: a very worrying prospect for any dog owner. Often they will target homes that have suitable dogs and mark the property with chalk. They then return or pass the information on to others who will attempt to steal the beloved pets. Many assume that they can’t use an alarm when they’re out or at night because of their pets but that’s not the case. You can have pet friendly sensors installed or even just set the alarm for doors and windows. When the weather is good it’s nice to be able to let your dog roam in and out of the garden but this is where your dog is most vulnerable at home. Make sure your fence is secure around the whole perimeter – they can just as easily be taken from an adjacent garden as the street – and your gate is lockable. Look out for any unusual markings on or around your property that could mean someone is planning to return and attempt to take your dog. Remove any marks straight away and be extra vigilant, looking out for anyone that may be hanging around. Very visible security measures such as an alarm, security lighting and CCTV would make even the most determined thief think twice. If the worst happened and someone did take your dog, the only real chance you have of getting them back is if they were micro-chipped. Some will dump the dogs if they find they’re not suitable for the purpose they’ve taken them for (eg if they’ve been spayed/neutered if they wanted them for breeding). Strays taken to vets or charities can be scanned and returned to owners if they are chipped. ‘Beware of the Dog’ signs, nose marks on the windows, dog bowls by the door etc all provide clues that there is a dog at the home. Obviously you can’t expect a dog to stay away from sight but you can reduce some of the obvious clues, particularly those that give an idea of the breed of dog such as window stickers or signs. We often find that often people are only prompted to increase their security after they experience an incident. Any break-in is traumatic and losing jewellery, electronics or cash is certainly upsetting but all those things are insurable and replaceable, to some degree. Losing a much loved family pet is quite a different prospect, especially when you consider the fates that could await them. We would urge you to be proactive and protect your pet and your home before the unthinkable happens. If you would like to discuss the ways we can help you protect your home and your animals please get in touch.